In 2010, architect and PhD candidate at the Royal College of Art in London, Julijonas Urbonas, from Lithuania, decided to attempt to design a method of euthanizing people that they might even enjoy. 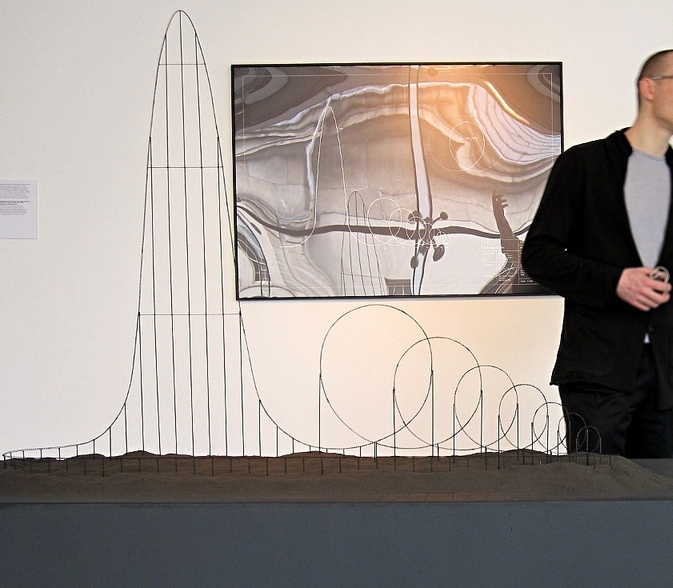 His solution- the Euthanasia Coaster, which he designed and built at a precise 1:500 scale. It’s a roller coaster that could seat up to 24 passengers and give them a good time before ultimately killing them in a painless and euphoric way. How does it work? First, the coaster takes the passengers up 1,670 ft (509 meters) (which would make it about 3.7 times taller than the current tallest roller coaster in the world, the Kingda Ka). Next, the passengers would plummet down the other side reaching a maximum speed of over 200 mph. Up to this point, it’s been all fun for the passengers, assuming they like roller coasters that is. If they, like me, find the free fall sensation to be extremely painful… well, up until this point, they’re going to have a bad time. And after, well… that’s not the best either. You see, what comes next is that, after the coaster hits the bottom, it then goes into a loop, which at the speed the passengers would be going at would exert about 10 G’s of force on them, enough to drain their brain of the necessary life giving nutrients and oxygen from their blood. Of course, if any survived, they could then just be run through the coaster again. Or, as they’re all likely to be passed out, at that point I guess someone could just shoot them or lop off their heads or something. They wouldn’t be conscious, so probably wouldn’t mind if some less fun method was used to kill them at this point. In theory, only people who wanted to be euthanized would be aboard the coaster. Further, the single long ride up to the top isn’t just for needed potential energy, but also to give the passengers a chance to consider their decision for a couple minutes as they climb. At the top, they choose to get off if they want. And, in fact, according to Urbonas’ design, the coaster would not continue down until those aboard all pressed a “fall” button, else the coaster would just stay there. The rider has a few minutes to contemplate his decision and his life in retrospect. He would find enough time to adapt to the height and get through a series of imaginary fatal falls, while realizing that the objects on the ground are getting smaller…The slightest movement of the car would trigger intense heart-beating and goosebumps and most importantly it would test your decision. Therefore the very top of the tower is an ideal place to give the very last word. This is PhD thesis work? @Wallace: No, I think this was just sort of a side project of his. I could be wrong though. Wouldn’t a centrifuge machine as used to train astronauts and pilots be a far simpler, quicker and cheaper alternative? There would be no worries about what to do with survivors either as you would just leave it on longer. Wouldn’t it be be wise to install two extremely sharp bends that would break the necks of the unconscious riders? @Scuffy: That’s one solution. After talking with the paramedic who also writes here at TIFO, he’s very skeptical this would actually kill many people for the reasons stated (though quite a few would die for other reasons), though he’s researching up on it more to make sure. Instead of using loops, wouldn’t it be much more efficient to make use of a banked downward helix? The initial drop can be much shorter and with the use of a helix and you should be able to greatly extend the amount of time the passengers would experience 10+ G’s. If you want to keep the force relatively constant (as apposed to continuously increasing as the train accelerates down the helix), you could have the diameter of the helix start fairly small and slowly expand as the train accelerates down the helix. Funny thing is…there was a famous roller coaster designer (I think) from years past who was once asked in an interview what the perfect roller coaster would be and he responded, rather morbidly, you send out a train with 30 people and they all come back dead. Mr Bones says: The ride never ends! I can imagine getting to the top with a fear of heights, too panicked to act rationally about the impending final decision regarding suicide, and far too panicked to contemplate stepping out of the car and toward the view from great heights. Pressing the button may be the only thing one can do to get away from the horrible height, and the only way to get back down to earth. For such people, this machine would be a cruel and fatal trap. A non-fatal version of this coaster (one which does not exceed 10G for 60 seconds) would be totally awesome. I immediately thought of a short story I read many years ago in school – “The Carnival” by Michael Fedo. Carnival rides to help alleviate overpopulation. Coming to a FEMA camp near you. I’m sorry to have missed this while fresh. Paragraph three mentions a speed of 200 mph while paragraph four mentions free fall. I should think 200 mph beyond terminal velocity for this coaster. Interesting, however. Far more creative than Madame La Guillotine. Urbonas is crazy good artist, designer, engeneer, researcher… , but not architect 🙂 For me he’s the No I Lithuanian Smart Artist. I’d like to go out peacefully quiet like falling asleep. Filled up with anesthesia and a nice deep stab or 20 to the heart and DONE. Nitrogen is the way to go: no pain, no despair sensation, no anxiety – just sleepyness until the last fall down..